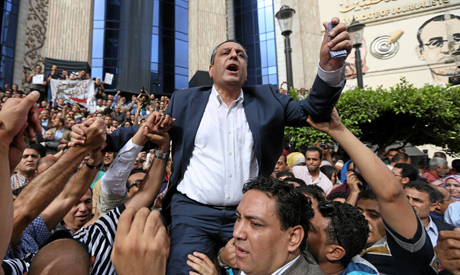 Egypt's Press Syndicate says it is giving the government one-week notice to meet a set of demands it set on Wednesday, at the top of which is the sacking of the interior minister. During an urgent general assembly meeting attended by around 2,000 journalists at the union headquarters in Cairo, the syndicate called on papers to publish a standardised preamble demanding the dismissal of the interior minister. The syndicate announced in the meeting that journalists would discuss on Tuesday starting a strike if their demands are not met by that day. The demands include the release of all journalists jailed in cases involving freedom of expression, an official apology from the presidency for the storming of the union's HQ, and the introduction of a law protecting journalists from assaults by state officials. On Sunday night, security forces had raided the syndicate premises on Sunday and arrested two journalists, sparking public outrage and prompting dozens of journalists to stage a sit-in at the syndicate headquarters. Around 2,000 journalists rallied at the syndicate's meeting today to discuss responses to the raid, chanting "journalism is not a crime," inside and outside the union's headquarters. The union also called on all papers to display a logo that reads "no for gag...no for silencing," in reference to a gag order imposed Tuesday by the country's top prosecutor on publishing in the case of the arrest of the journalists. The general assembly meeting also agreed to immediately take "legal measures" against the order. The police raid of the union's headquarters on Sunday was the first in the 75-year history of the institution.